evolution | Vincent Cannataro, Ph.D.
I’m taking a Teaching Careers/Methods course and our first assignment was to develop a class we’d like to teach and give a little mini-lesson to convey some learning objectives and outcomes of the class. I proposed a class dubbed “Programming and Quantitative Methods in Biology” (or should it be quantitative methods and programming in biology?). Regardless, it’s meant for upper level undergraduates, and the idea is to give students the means to model and simulate biological systems and interpret the underlying biological phenomena at play. I wanted to turn the teaching of biology on its head a bit, instead of learning words and formulae (for example: drift, selection, p+q=1) and then trying to associate them to some dynamics in your head, you “generate” the biology, observe and manipulate the dynamics, and then learn the corresponding biological concepts. I guess I spent a lot of time in college memorizing terms instead of understanding concepts and I didn’t realize the difference until I was in graduate school. Anyway, I’ll give a synopsis of my mini-lesson below. Please feel free to expand and improve or implement these ideas yourself. You have to save both .R files into the same folder and then open R, open the HW_dynamics_master.R script, and set the folder you saved the files to as your working directory. 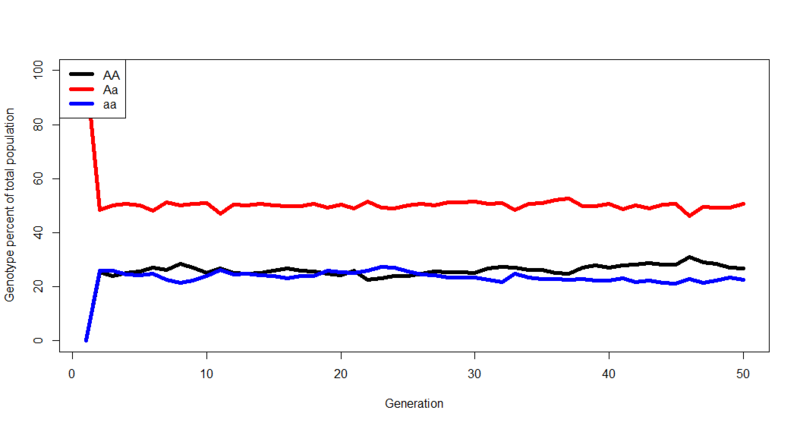 Then you can manipulate the parameters, run the whole script, and see the resultant evolutionary dynamics. 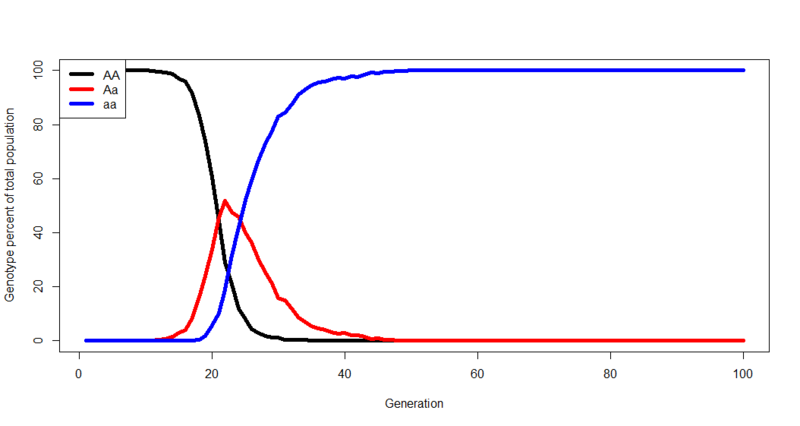 What do you think will happen to the genotype distribution if you run the simulation with these initial parameters? #Some measure of relative fitness. "Expected AA= 0.25 | Expected Aa= 0.5 | Expected aa= 0.25"
Now the fun begins. What would happen if we started violating these “key assumptions” underlying the Hardy-Weinberg principle? Let’s see. What do you think might happen if we started with 20 heterozygotes instead of 2000? Woah woah woah, our equilibrium is all off! 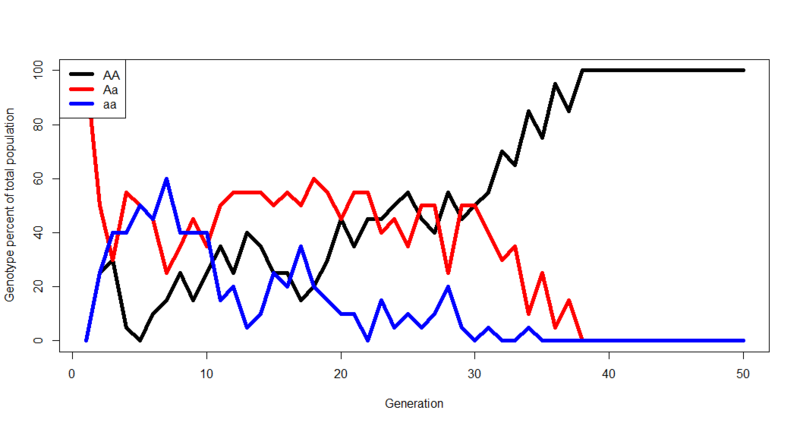 In fact, an allele went completely extinct after 38 generations. It’s almost like one of the alleles drifted towards fixation in this population. What if the heterozygote left, on average, twice as many offspring as either homozygote? All of the genotypes remain in the population! This is a good spot to bring up fitness, overdominance, and underdominance. 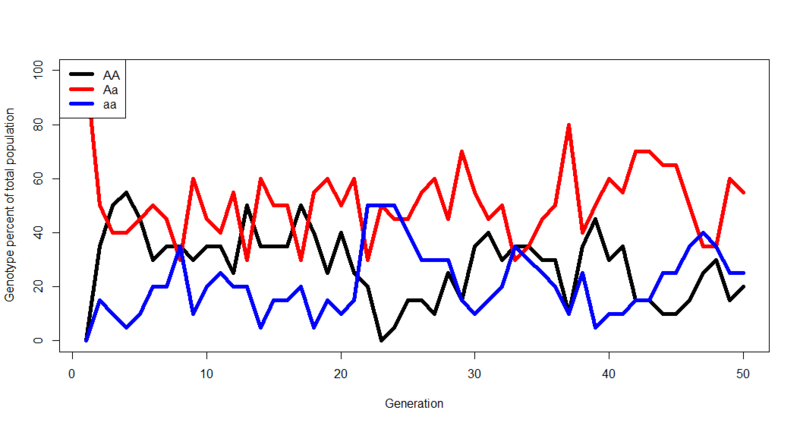 Chances are that whatever resultant dynamics you observe from the model have already been described by population geneticists. And that’s the point- you generate the biology, figure out what’s going on to lead you to the dynamics you observe, and learn how these biological phenomena have been previously described. There will also be a focus on the limitations of models and simulations. Anyway, that’s my idea. Your thoughts are appreciated!